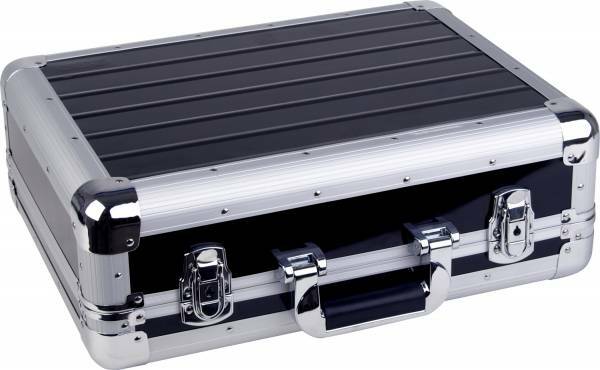 Product information "Zomo CDJ-2 XT - Flightcase 2 x CDJ-100/200/350/400"
The Zomo Flightcase CDJ-2 XT is the ideal solution for 2 x CDJ-400, CDJ-350/CDJ-200 or CDJ-100. Doesn´t matter if you have 2 Players of the same model or 2 different ones. There are fitting 3 different models in this case! The CDJ-2 XT is very space-saving and is constrained on the essential – Effectivity! Equiped with a divider in the middle and a removable lid - the case shows it´s great fonctinallity! The perfect height and the position of the players is guaranteed by the additional foams which are also included in the delivery – so the Slot-In can be used without any problems! The integrated locks in the closings of the case, as already built in the CDJ-1, are ensuring perfect safety for your valuable players. The optimum useage of the possibilities you can explore in connection with the Zomo laptop stand LS-1. With this connection you can work on two levels and the laptop stand can be placed over the CDJ-2 XT. Customer ratings for "Zomo CDJ-2 XT - Flightcase 2 x CDJ-100/200/350/400"